Castelli have been making cycling clothing since 1910 so it’s fair to say they certainly know their stuff when it comes to producing kit. They have made clothing for some of the greatest cyclists of all time including Alfredo Binda and Fausto Coppi and have been constant innovators leading the way in fabric technology and design. Their list of ‘firsts’ are common place these days and copied by all manufacturers so we have Castelli to thank for coloured shorts, sublimation printed jerseys, windproof membranes and anatomic seatpads among other ideas. More recent innovations have been the lightest jersey and also the most aerodynamic jersey in production. Sponsorship of many professional cycling teams over the years has led the development process with pro riders constantly wanting the most comfortable and efficient kit available. Many of the items in the current range have been developed with collaboration from the Garmin-Sharp pro team resulting in ground braking garments in terms of design and fabric use and cut. The need for lighter and more aero kit has led to the Speed Suit in both summer and winter versions as well as aero winter kit which does away with the usual associated bulk but is still warm and breathable. The 2014 autumn winter range features many garments developed with professional riders with touches all cyclists will appreciate. Here are a few of our favourite new pieces along with classic garments that although have been around for a few seasons are kept in the range with a slight tweaks for good reason. The range-topping Alpha is Castelli’s top of the range jacket which is both waterproof and windproof but without the bulk. The real beauty of this jacket is the detached insulating layer from the windproof layer which means when you open the zip the inner layer stays close to the body to help evaporate moisture but saves you from a cold blast at the same time. An aero cut ensures no cinches or flapping when in the riding position while the articulated neck stays in position whether riding or drinking coffee. Three rear pockets, including a zippered credit card compartment, and a small zippered pocket in the front allows you to carry all the usual necessities without compromise. Available in black in sizes S – 3XL. The Gabba 2 is the long sleeve version of the hugely popular windproof Gabba short sleeve jersey which is waterproof, breathable, lightweight and aero. This is the perfect jersey for autumn rides in changeable weather with its temperature regulating panels and zip vents and a long back to keep spray at bay. The close-fitting nature means you hardly feel it on while riding and in a wide range of sizes from Small to 3XL there’s a size to suit all. As with most Casteli garments, the colour options are all modern and on-trend. The Sublime long sleeve jersey has been a real Marmite jersey for us here. Some love it and some hate the design but you can’t argue that it isn’t visible, especially with the reflective tabs on the back. What we can’t fault though is the impressive design features with Warmer fabric on the body and to keep the core warm and Warmer X-Stretch on the sleeves for freedom of movement. Three rear pockets and a size range from Small to 3XL should ensure there’s a size for everyone and something to talk about when you turn up to a ride in one. And let’s not forget the added bonus of having a picture of a big scorpion on your chest! Velocissimo tights have been in the range for a few seasons now and for good reason. These have been a constant best seller and have been slightly tweaked this year to include a seat pad due to demand, don’t worry they are still available without pad if you prefer. 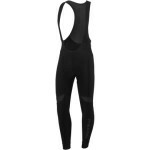 The Thermoflex fabric keeps the legs warm while the mesh bibstraps are very breathable. There’s an ankle zip to keep them in place but easy to remove and the reflective piping is a reassuring feature. We also like the more subtle logos as you have to be close to see them. Available in sizes Small to 3XL in any colour you like as long as it’s black. The Squadra Long jacket is a lightweight packable rain jacket that has been a firm favourite with riders for several seasons. With a full zip, high neck, elasitcated cuffs and a long drop back it’s perfect for keeping the worst of the wind and rain off on showery days. It also rolls up very small making it perfect for rolling up and storing in the back pocket or saddle bag. 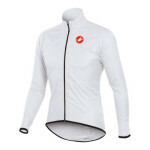 Available in black, white or hi vis yellow in sizes Small to 3XL and at a staggering low price for Castelli, we can see why this is such a popular piece of kit. 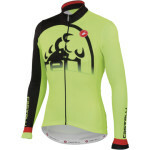 View all our Castelli products. 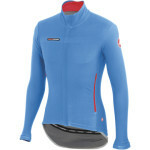 Tagged alpha, autumn, binda, castelli, coppi, gabba, squadra, sublime, velocissimo, Winter. Bookmark the permalink.